Beat 1 egg and the water in a small bowl with a fork. Heat 1 tablespoon oil in a 10-inch skillet over medium heat. Add the spinach and garlic and cook for 5 minutes or until the garlic is tender and the liquid is evaporated, stirring constantly. Remove the skillet from the heat. Let the spinach mixture cool to room temperature. Beat the remaining eggs in a large bowl with a fork or whisk. Heat the remaining oil in a 10-inch skillet over medium heat. Add the eggs and cook for 1 minute or until set, lifting the edges of the omelet with a spatula to let the uncooked egg run underneath during cooking. Do not stir. Remove the skillet from the heat. Let the omelet cool to room temperature. Heat the oven to 375°F. Unfold 1 pastry sheet on a lightly floured surface. Roll the pastry sheet into a 14-inch square. Press the pastry into the bottom and up the sides of a 9-inch springform pan, leaving the excess pastry draped over the sides of the pan. Brush the pastry sheet with the egg mixture. Layer half the mozzarella cheese, half the turkey and half the peppers in the pan. Spread with half the spinach mixture and top with the omelet, trimming to fit, if needed. Layer the remaining spinach mixture, peppers and turkey in the pan. Top with the remaining mozzarella and the Parmesan cheese. Unfold the remaining pastry sheet on a lightly floured surface. Roll the remaining pastry sheet into a 10-inch square. Place the pastry sheet over the filling. Trim off any excess pastry and discard or save for another use. Fold the edge of the top pastry over the bottom pastry and press to seal. Brush the pastry with the egg mixture. Place the springform pan on a shallow-sided baking pan or wrap the bottom of the pan with a double layer of foil. Bake for 45 minutes or until the pastry is golden brown. Let the torta cool in the pan on a wire rack for 30 minutes. Tip: You can roll out the excess pastry and cut it into decorative shapes using a knife or a cookie cutter. Place the shapes onto the torta and brush with the egg mixture before baking. 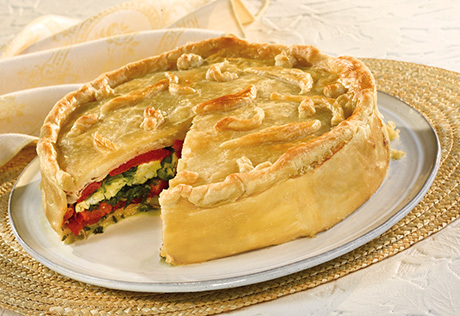 Make Ahead Tip: Prepare the torta as directed above. Cover and refrigerate for up to 24 hours. Let the torta stand at room temperature for 30 minutes before serving. Serving Suggestion: Serve with an arugula salad tossed with toasted pine nuts and honey mustard vinaigrette. For dessert serve watermelon and honeydew slices.